Toronto, ON – The Canadian Hockey League today announced that New York Rangers prospect Anthony Duclair is the CHL Player of the Week for the week ending January 26 after scoring five goals and three assists for eight points in three games with a plus-minus rating of plus-3. Duclair led the Remparts to three victories on the road last week giving the club nine wins in their past 10 games including a season-high six game winning-streak that has helped boost them into fourth place in the QMJHL standings with 66 points. He opened the week on Thursday night with a four-point performance that included a hat-trick capped off with his 40th goal of the season claiming first star honours in a 6-2 win over the Gatineau Olympiques. On Saturday night he scored twice including the game-winner for the second straight game and also added an assist in an 8-5 win over the Val’d’Or Foreurs. His week wrapped up on Sunday with an assist in the Remparts’ 3-0 win over the Rouyn-Noranda Huskies. 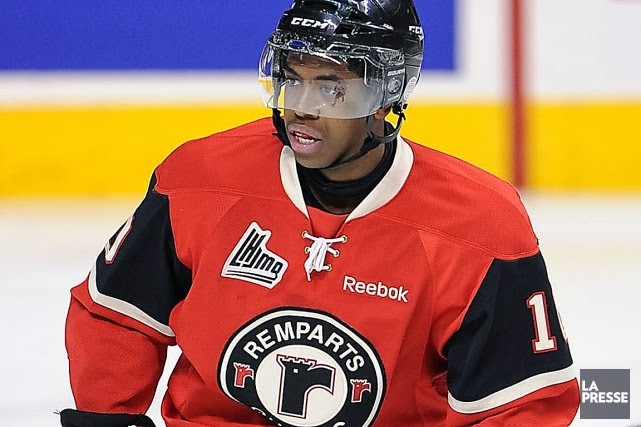 Duclair, an 18-year-old from Montreal, QC, is playing in his third QMJHL season with the Remparts. Selected by the Rangers in the third round of the 2013 NHL Draft, Duclair is currently second in QMJHL scoring with 75 points in 47 games played. Also considered for the award this week was Nashville Predators prospect Brendan Leipsic of the Portland Winterhawks who scored three times with six assists for nine points in three games, while 2014 NHL Draft prospect Josh Ho-Sang of the Windsor Spitfires scored three goals and four assists for seven points in two games.